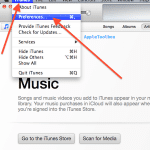 Make sure that your iOS device and iTunes are up to date. Make sure that your have an active Wi-Fi, internet connection. Make sure that iOS devices and computer are connected to the same network over Wi-Fi. iOS: Difference between sync and backup? The third bullet worked for me. I am note even sure I followed the instructions in the exact right order, but basically I closed iTunes, disabled wifi, shut wifi (which with my cable company is part of the cable box for the 2nd TV) off, then computer and iPhone 4. Restarted wifi/cable box, started computer and iPhone, started iTunes and my iPhone was then recognized in iTunes.